Here's the cost breakdown of our Lego party. Worth every penny to see Andrew glowing with happiness! Total Cost: $32 for 10 kids plus parents. We budgeted this from our monthly hospitality envelope. have to spend $200 to throw an awesome Lego birthday party. Momadvice's Lego party used free printables and a homemade cake to stay under budget. Found our racetrack idea at this Lego party site. Ran out of time to make Lego cookies on a stick. It's A Mom Thing's creative princess party used them for centerpieces and favors. Wanted my kids to wear Lego brick t-shirts using GraceViolet's freezer paper stencils. Bookmarked this cool Star Wars party, with homemade Jedi robes and light saber cupcakes. Need a theme cake? 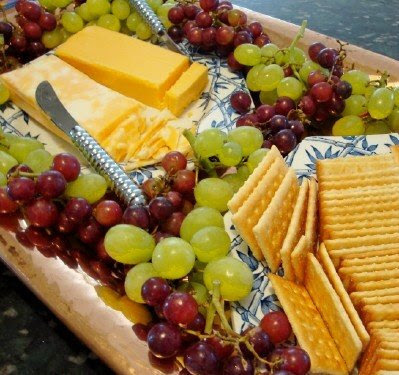 LifeAsMom's creations will inspire you to do it at home. If you have a budget birthday post on your blog, leave us a link in the comments below! Wow..that is amazing how little you spent. If I did that, I think my husband would jump for joy and click his heels! Very nice. I'm sure he was thrilled. Great work, as always, Meredith! I'm SO impressed! I want to be just like you when I grow up :). What a fun party! You did a great job using what you had. And thanks so much for all those links. I'll be holding on to them for reference:) I really love throwing a successful kids party without spending a fourth of what the local moms usually spend. We used what we had for Levi's star wars party and had a blast. My son who loves Legos and Star Wars has a birthday in May. Thanks! Great job on the Lego party! I'm always amazed at the money that is spent on some parties...great to hear of a frugal, fun party. Thanks again for posting, love your blog...so much inspiration. Great party, Meredith! We recently did a frugal family day with our son and it would make a great birthday party idea. It was a pirate scavenger hunt and the only cost was for some dollar store prizes as the "treasure." You had some very clever ideas for the theme party. I especially liked the mailbox cover. Now we are waiting to see what you come up with for Elise! Was the chocolate cake large enough to serve 10 kids and the parents or did you have cupcakes, etc. that were not shown? Absolutely enough cake. This was a very rich 2-layer cake about 11 inches in diameter. It looks smaller in the picture. It was so rich that most kids didn't even finish the piece they were given plus ice cream. Most parents didn't eat a piece. We had to schedule the party from 2-4 on a Sunday afternoon due to Valentine's day being Saturday. Otherwise I would have offered more food. As it was I didn't know exactly how many people for which to buy (no one RSVPs anymore!) and had about 1/4 cake plus tons of grapes left over. I SO agree, and the fun part for my daughter has been the games that they play - all simple parties in our home (listed on my sidebar). Great post! Thank you Meredith for the breakdown! Wow, great job! I never would have thought about looking at a thrift store for party favors. Can't believe that's all it cost. I sent the Star Wars party link on to my husband. He and I are both impressed that she made Jedi robes for the party guests! Cute ideas! Looks like you threw a great party for so little money! As always, I'm impressed! I have so enjoyed these posts and am definitely thinking a Lego party is in my sons future. Thanks for the encouragement that it can be done on a budget. If your kids are not up to finishing the grapes, freeze 'em! Yummy snacks. Your party planning was awesome! I totally agree with you. Some of the best parties I have thrown have cost the least! Good budgeting! We have a wonderful "Penny Per Plate" party store near our house. We usually go there and let the sales inspire our theme. Just last night we had an adventure party for our 4 year old. We weren't quite as frugal as you but I think our total was around $100, and that incluced 4 pizzas! 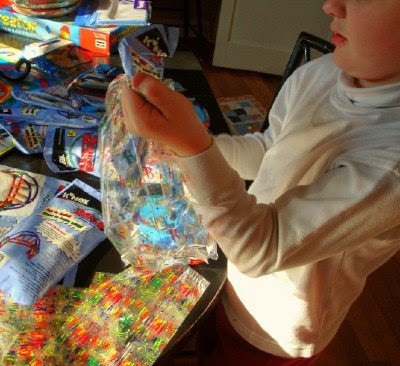 Did you get the K'nex kits at a thrift shop? I have never seen little kits like that, and would love them for my son's birthday. Oh, how I wish we had thrift shops around here like you do! Yes, and I've never seen these K'nex kits before! They are leftover Teacher Packs--each builds one arch bridge. They were in the thrift shop area where random stuff is sold in plastic bags. I hate to tell you how little I paid--$1.69!!! Then I was at the Goodwill, where they had McDonald's Lego sports toys from 2004. $1.99 for 12 still in the packages. They are selling to collectors on Ebay for about $2 each. I also included the chocolate coin bags as prizes, which cost 10-cents each after Christmas. Awesome birthday posts, Meredith. I'll definitely have to store it away in my brain for when theEdge gets older. Hopefully my memory will return some by that point. I bet Andrew and his buddies had a blast! It's so fun to see what a little creativity can bring to a party. Merideth! You are an amazing woman! Love all your party tips and great photos. Just purchased the Blissdom audios and see you were there. Yeah! Now to find the time to sit and listen, soon, soon...this weekend! Yes! Thanks for sharing! After looking at all your posts about the Lego party my boys want to have one. Since we don't do individual birthday parties, this might be a fun spring activity on the back porch. My first born's first birthday party cost somewhere in the ballpark of $300 and that didn't count his birthday present. We're planning much more frugal parties now. :) I found invitations for my daughter's ladybug-themed party at Target for only $1.00! Now you have definately got me thinking. My sons love lego and I am now seriously considering next time we have a kids party to do something like this for sure. Thank you! Its nice to see another parent who also doesnt think you need to spend an incredible amount of money to have a great party. Thumbs up!